Provide comfort for the family of Jean Crowder with a meaningful gesture of sympathy. Passed away peacefully of pancreatic cancer on March 15th, 2019 at the Brockville General Hospital, Garden Street Site. Laura Jean (Kerr) Crowder, at the age of 80 years. Loving husband and dance partner Carman for over 60 years, and much loved mother of Greg (Kim) and their two children Courtney and Brooke and Murray (Nancy) and their children Caitlyn and Curtis. Predeceased by her parents Robert and Dorothy (DeMary) Kerr formerly of Aylwin, PQ; two brothers Freeman and Wayne and by a sister Velma. At the request of Jean, a private family interment will be held At Roselawn Memorial Gardens, 2451 County Road 15, Maitland at a later date. As expressions of sympathy, donations to the Brockville General Hospital Foundation Palliative Care Unit will be gratefully acknowledged. Send condolences or make a donation online at www.irvinememorial.com. At the request of Jean, a private family interment will be held At Roselawn Memorial Gardens, 2451 County Road 15, Maitland at a later date. 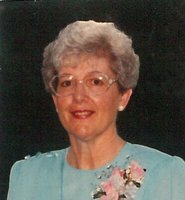 Provide comfort for the family of Jean Crowder (Kerr) by sending flowers.